Dynamics in the PC world have entirely shifted this year, and much dramatically so, thanks to the launch of Apple’s iPad and its instant success. It’s well spotted that electronics and computers are on an ever changing orbit and newer technologies are introduced almost every day, yet iPad seems to have heralded a new era in itself. 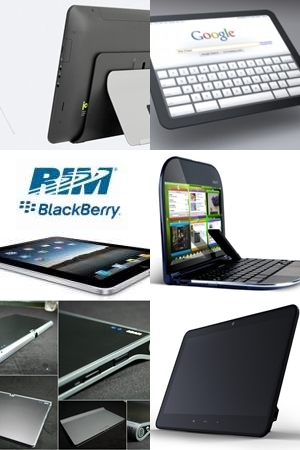 Instantly after the iPad’s launch we hear news coming from all directions on various PC makers jumping and flooding the tablet market with better, faster and thinner tablets. It’s time we reviewed the most important iPad alternatives/competitors and what value add they bring to the market. Intel’s Tablet: Its main highlights are USB, SATA and a cheaper memory solution. This dual core tablet also allows printing. BlackBerry Cobalt /BlackPad: At 8.9 inches this is a much smaller and thinner tablet. Though everything remains a rumor until we get an official confirmation from RIM, it’s projected only as a BlackBerry companion device. Notion Ink’s ADAM: This device can support 20 hour battery life, 1080p high definition video on its 10″ screen and also features a 3.2mp 180 degree rotating camera. JooJoo: Featuring only one physical button and a 12.1″ touch screen, the device boasts the fastest startup in the world, connecting to the internet in a mere 9 seconds. Lenova Skylight: This smart book has no touch screen but a full size key board, 10 hour battery life and weighs 2 lbs. ICD Vega: Produced by Innovative Converged Devices, the Vega features a large, 15.6″ touch screen with 32 GB of internal SD storage, a removable charging dock/stand and the ability to play on-demand Web TV. Verioogle Tablet: Verizon also confirmed this Wednesday that they are working on Android powered tablet with Google but specs so far are left to our wild guesses. While it puts constant pressure on top industry players to keep innovating themselves, consumers rejoice every time we see a paradigm shift in the industry. Rightly as they say, consumer is the real king. Any idea about the prices? This was a fantastic article – I had no idea how many companies were ready to compete! I liked how you organized it in list form – it made it easy to compare statistics.